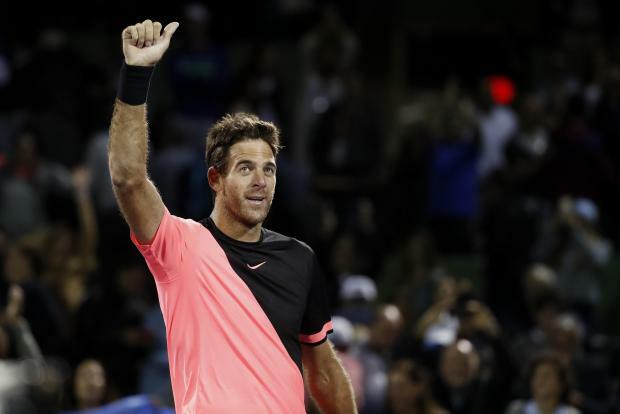 Juan Martin del Potro remained on course for a rare Sunshine Double when he outlasted Milos Raonic 5-7 7-6(1) 7-6(3) in a marathon quarter-final at the Miami Open on Wednesday. Del Potro, who claimed the Indian Wells title earlier this month, fed off the energy of a raucous crowd that was firmly behind the Argentine, wearing down the 20th-seeded Canadian in a match lasting almost three hours. The clock had just struck midnight on an unusually cool evening when fifth seed Del Potro finally dispatched Raonic. The Canadian was defeated despite not facing a single break point in the first two sets, before the contest took a bizarre twist at the start of the decider when both players were broken twice in a row. Order was soon restored as both men held for the next eight games, sending the contest to a deciding tiebreak, in which Raonic never recovered after double-faulting to fall 2-0 down. The result continued Del Potro's hot streak, after he won in California 10 days ago, beating Roger Federer in a compelling three-set final to claim a maiden Masters 1000 title. The 2009 U.S. Open champion is back to playing some of his best tennis in years after battling serious left wrist injuries that required three surgeries and threatened to curtail his career. He advances to face another big server, American John Isner, who overwhelmed South Korean Chung Hyeon 6-1 6-4 in an afternoon match. A fired up Isner yelled "Come on" and pumped his fist when he broke Chung's serve in the first set to race to a 3-1 lead, ending the Korean's streak of 27 consecutive holds of serve. The 14th-seeded Isner cruised through the remainder of the 25 minute opener, in which he fired seven of his 13 aces. The hour-long contest was all but over once Chung sent a forehand long in the fifth game of the second set to hand Isner another break and a 3-2 lead. The 21-year-old was unable to find an answer to Isner's booming serve in a match where he failed to convert his only break point opportunity and was himself broken four times. "I played extremely well. Every match I've played in this tournament I've gotten better," the 32-year-old Isner said in a courtside interview. "I keep getting stronger and that's a very, very good sign going forward. I know I'm in the semi-finals and I can't wait to get back on this court." Isner added that the hot and windy conditions in Miami, where the courts are not particularly fast but cause the ball to bounce high, suit his first-strike approach to the game perfectly. "Del Potro is the hottest player on tour right now, hands down," Isner added. Juan Martin Del Potro will face John Isner in the semi-finals of the Miami Masters.